This book is a completely unique and novel presentation of the Catholic Faith for children. It is a rare combination of gifted writing, wonderful vibrant illustration, exquisite design and highest quality printing. 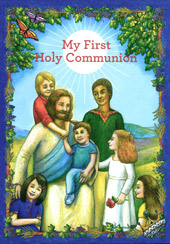 Through beautiful art and story this book takes young readers, in the company of their parents and grandparents, into the mystery of the Eucharist as they prepare for their First Holy Communion. This fascinating presentation tells a bird's eye version of God's story of love for his children that is found in the Bible and explains First Holy Communion in the context of that great adventure. This book was first published in Falcarragh, Co Donegal, Ireland by Clonmacnois Press in 2010. It comes with an official Nihil Obstat from renowned theologian Rev Dr D Vincent Twomey SVD and an Imprimatur from Bishop Philip Boyce, Diocese of Raphoe, Ireland. It is rare nowadays to be able to recommend material of a catechetical nature that is really suitable for the preparation of children for First Communion, but this book is the exception. The author of My First Holy Communion has succeeded in bringing together the basic rudiments of the faith needed to receive the sacraments in an exemplary fashion. She has also expressed these fundamental truths in a language that is simple yet profound. The book will open up the child's mind and heart to the mysteries of our faith. The text is presented with graphics and images which are both beautiful and inspiring. I have no hesitation in recommending this delightful -- and much needed -- introduction to the faith for children preparing for First Confession and First Holy Communion. Deirdre Mary Ascough, qualified teacher and mother, has a Bachelor degree in Theology from Milltown Institute, Dublin, and a Masters degree in Theology from the Franciscan University of Steubenville, Ohio, USA. Lisa E. Brown is a highly accomplished artist who works in a wide variety of media. She was commissioned by Pope John Paul II in 2002 to provide 10 giant portraits of well known saints for the World Youth Day in Toronto, Canada. We plan to produce translations of this catechism into several languages in the near future.